with interior design by Omega. 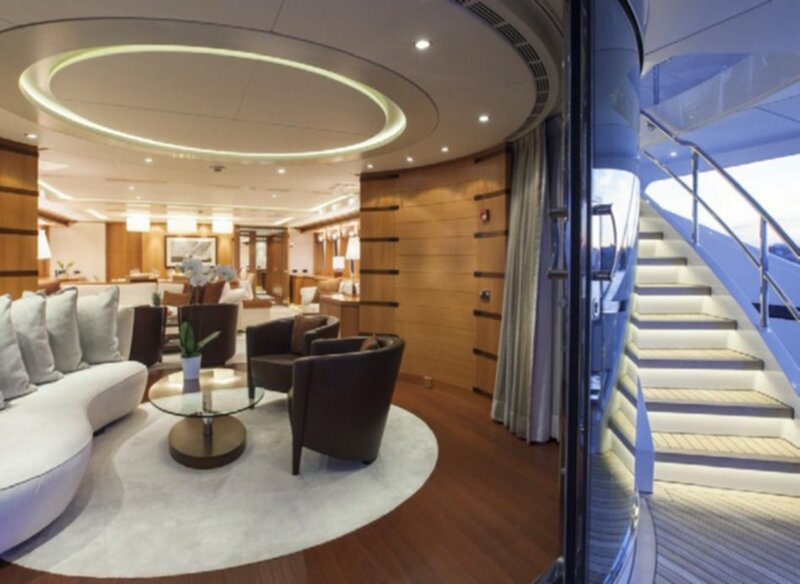 Frank Laupman, from Omega, and Heesen have created an exterior styling which features sleek and elegant lines. 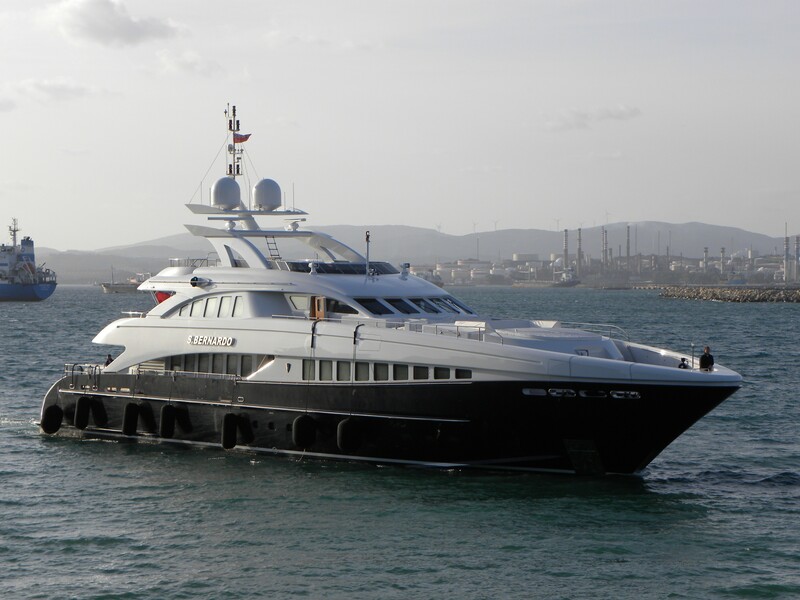 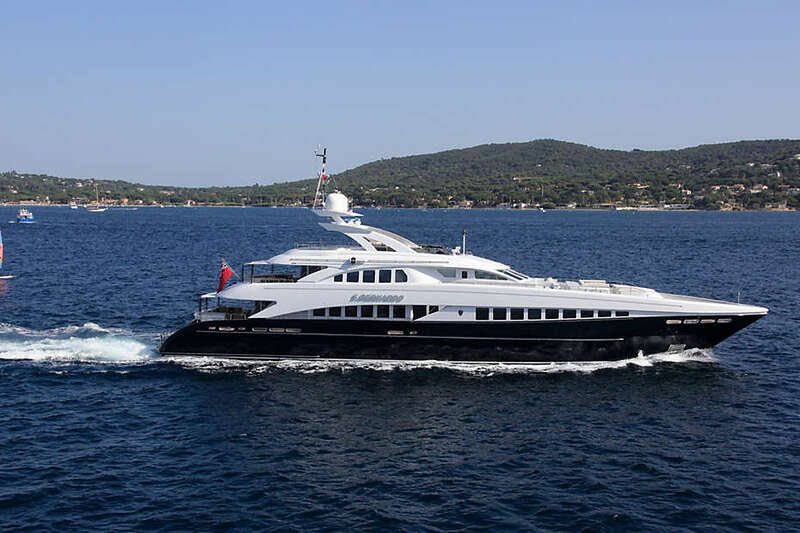 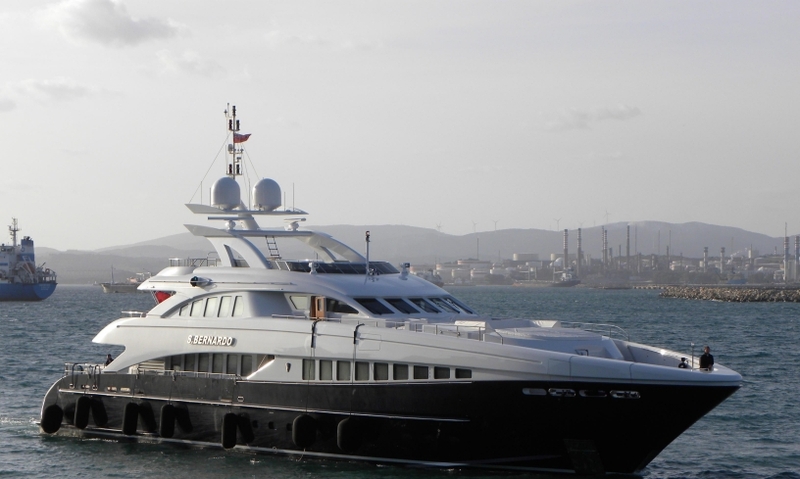 This distinct model - along with the superior comfort and the high-quality workmanship that Heesen is known for - accounts for the known success of series motor yacht. 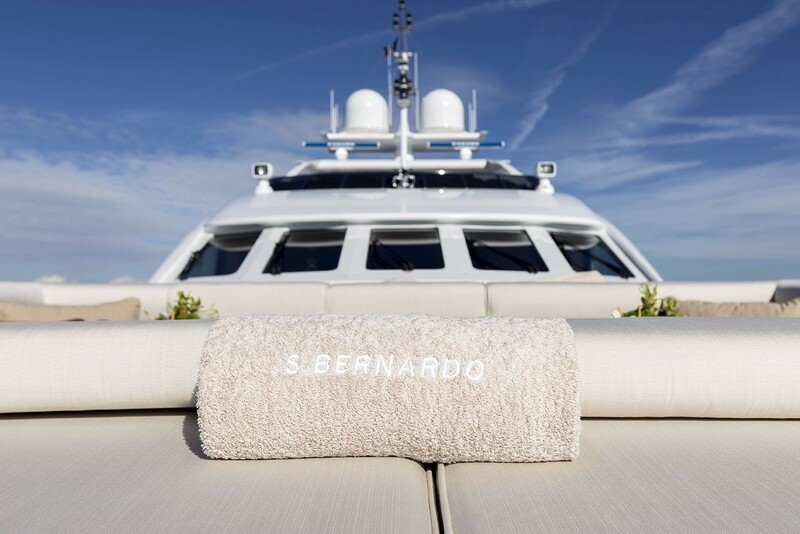 SAN BERNARDO yacht can accommodate a maximum of 10 charter guests, sleeping in five cabins, and 12 guests when day cruising. 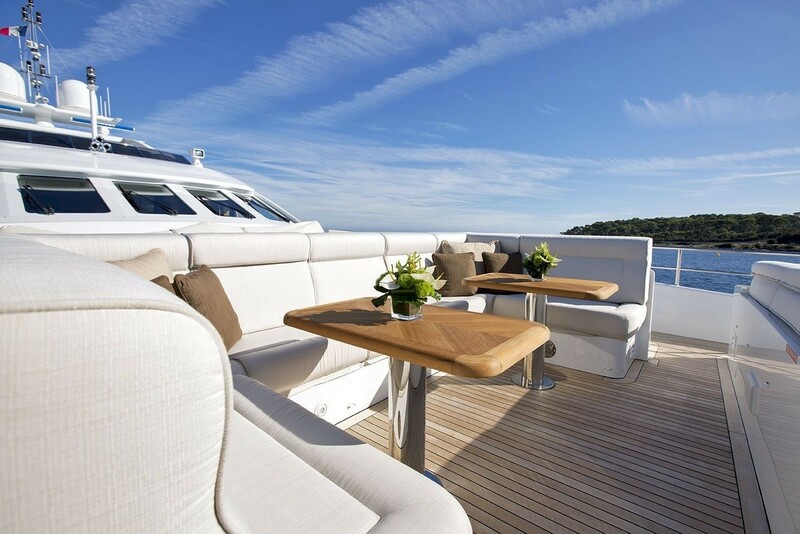 The layout on superyacht SAN BERNARDO is conceived for making the most of the outdoor living. 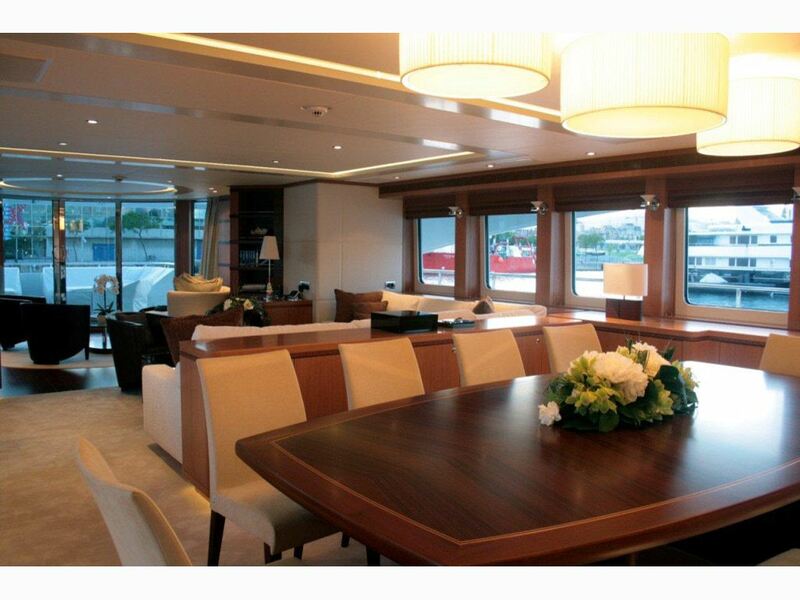 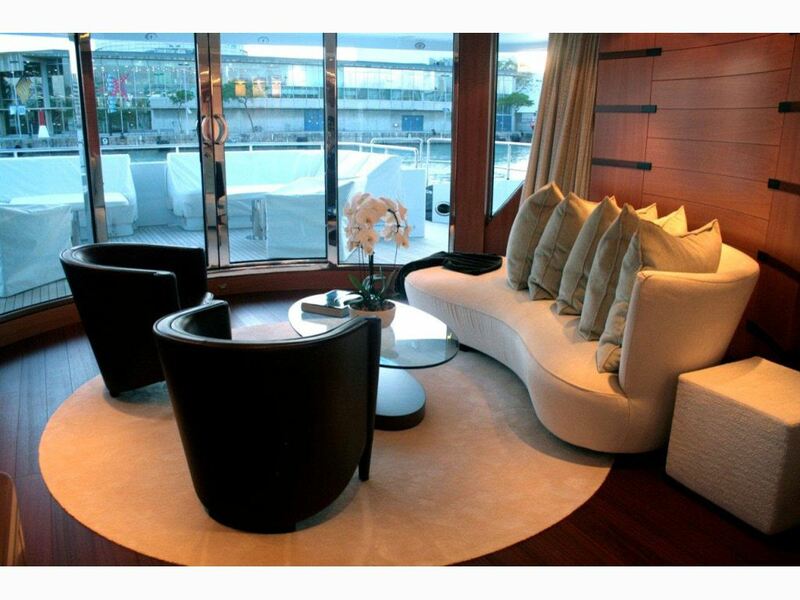 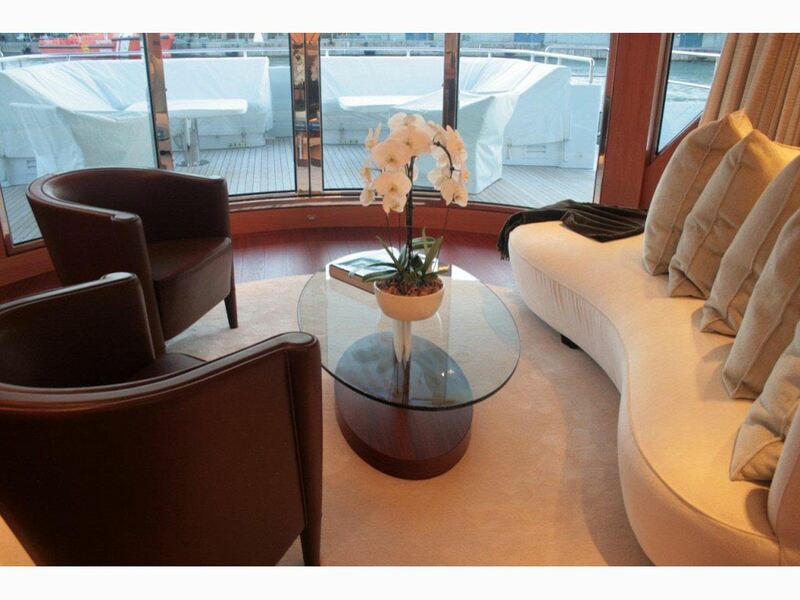 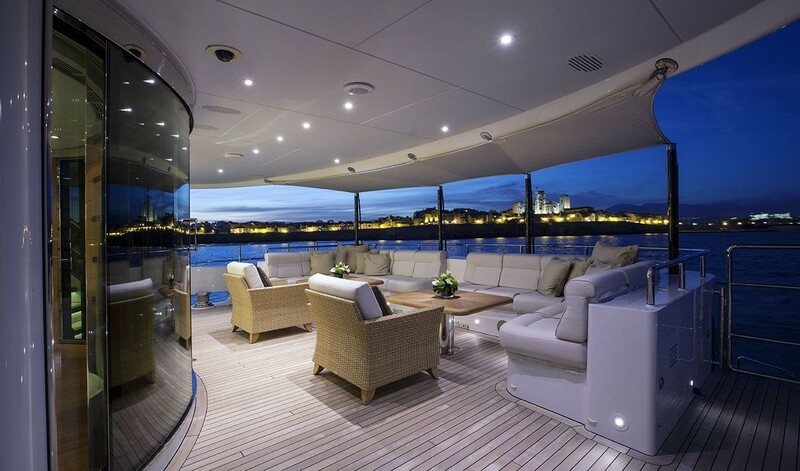 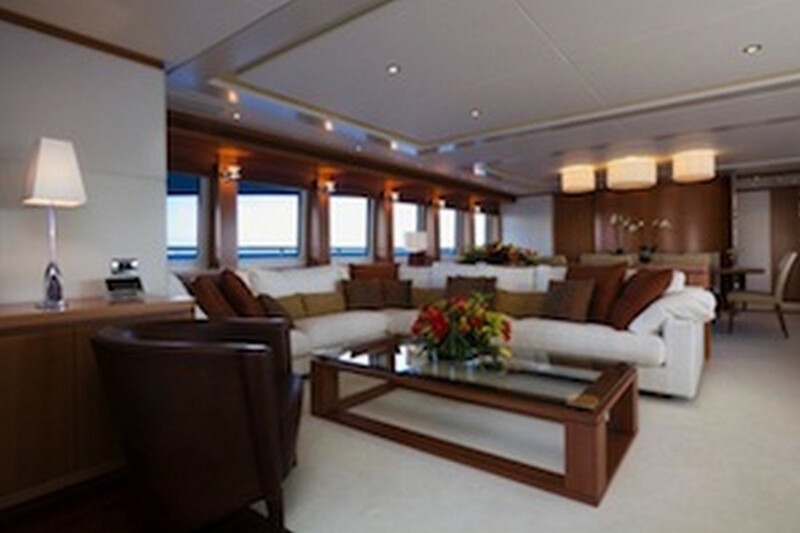 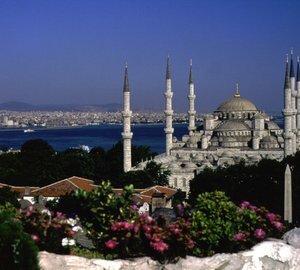 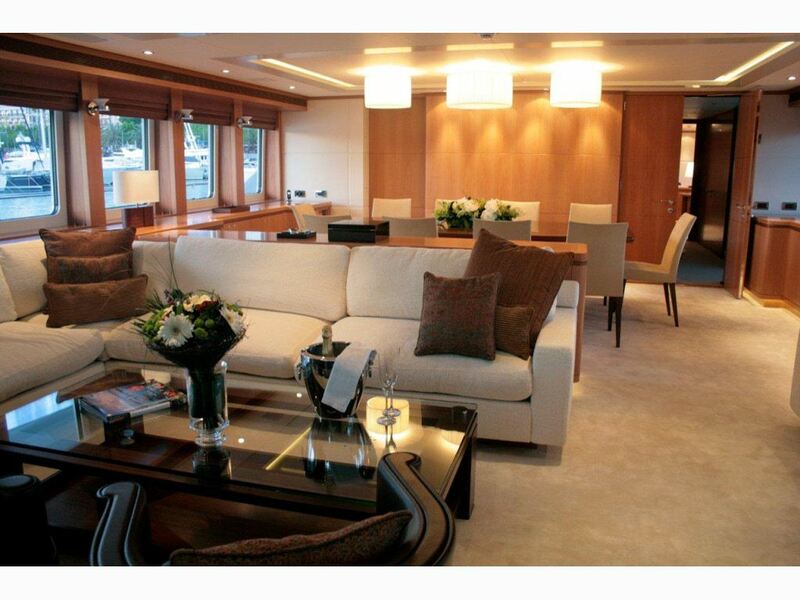 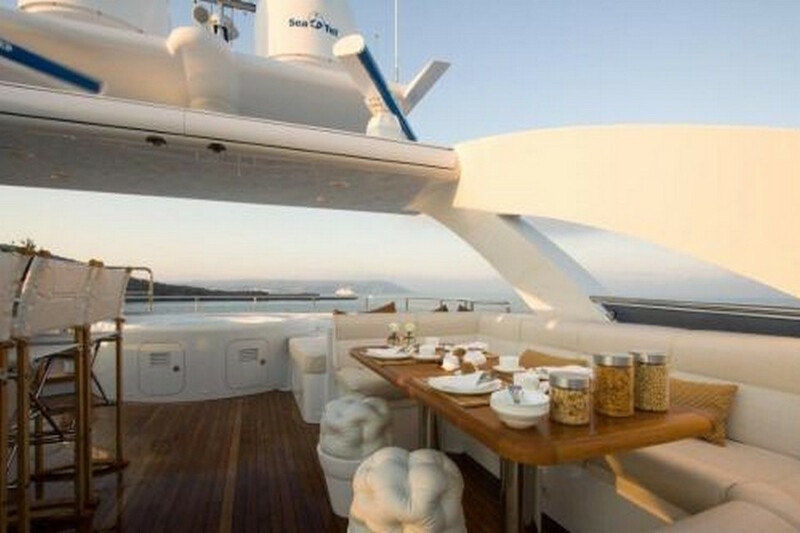 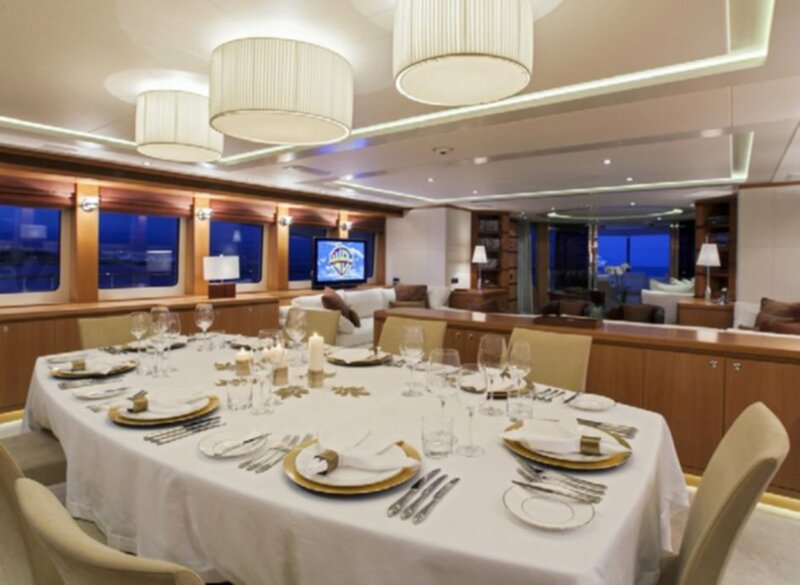 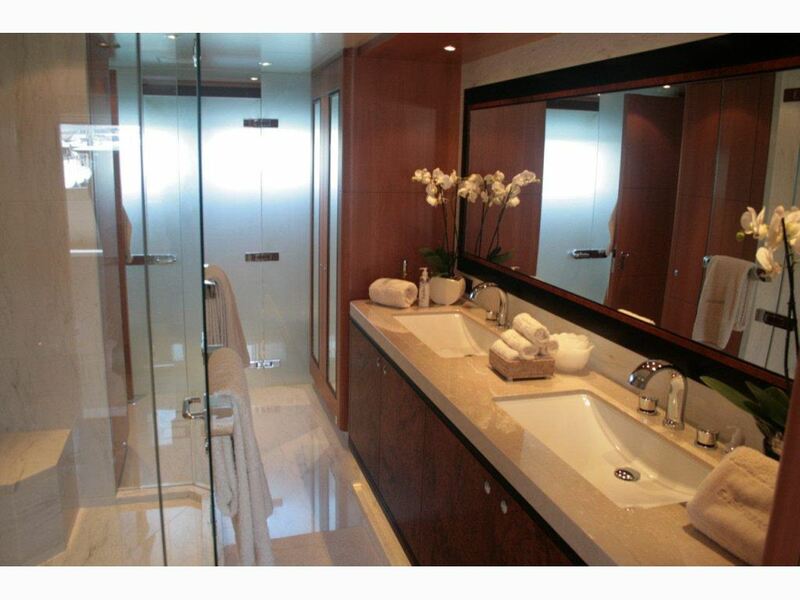 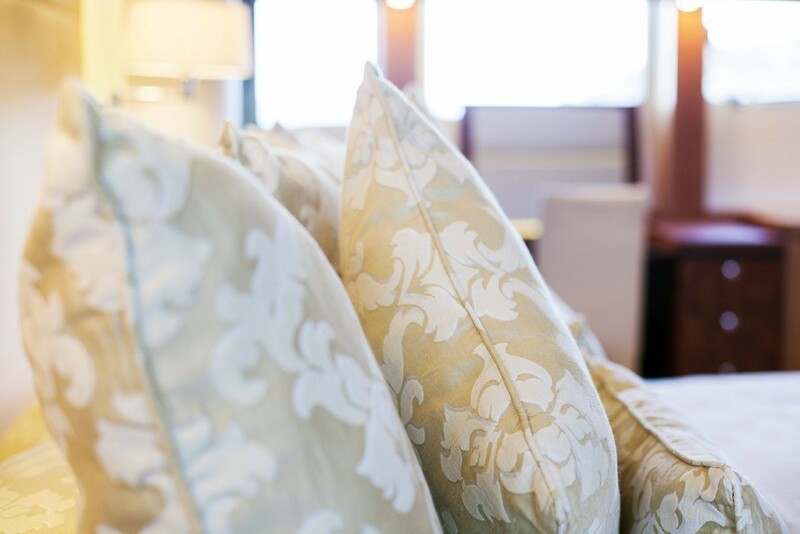 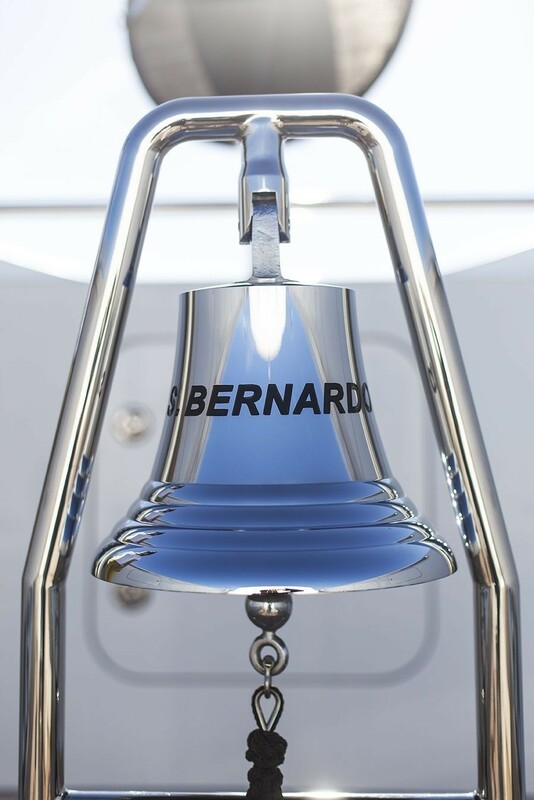 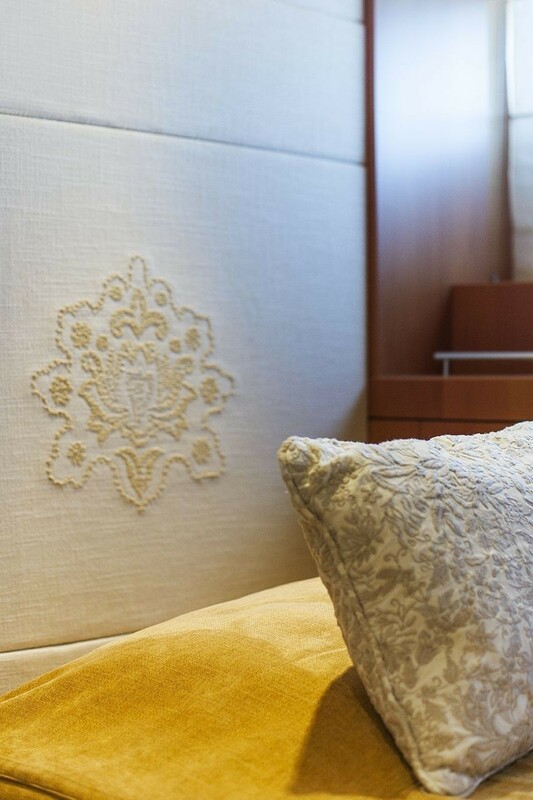 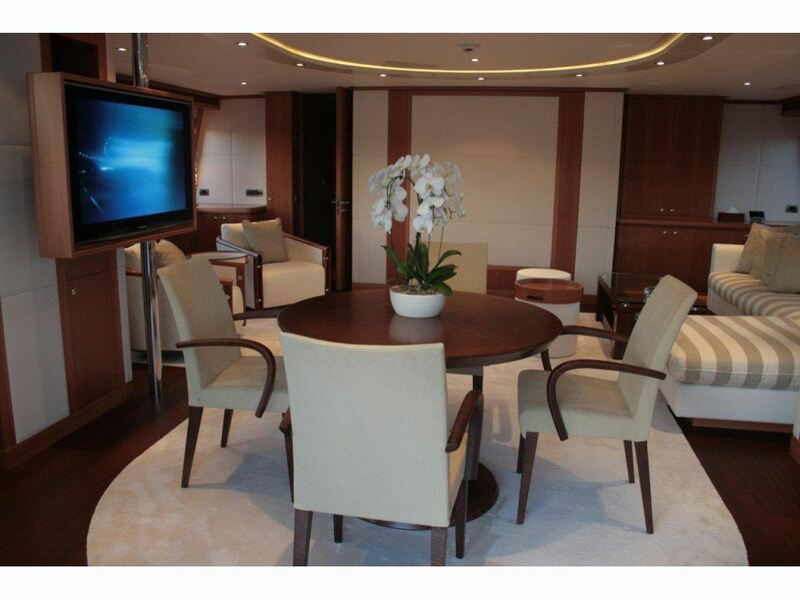 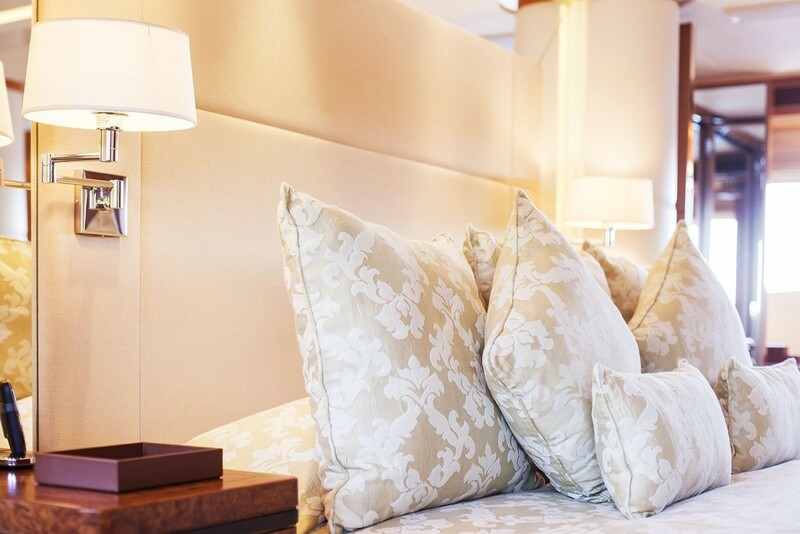 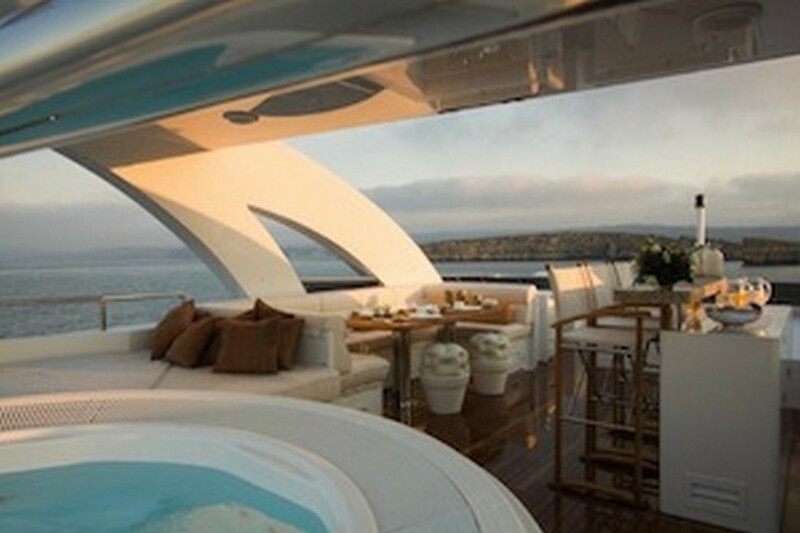 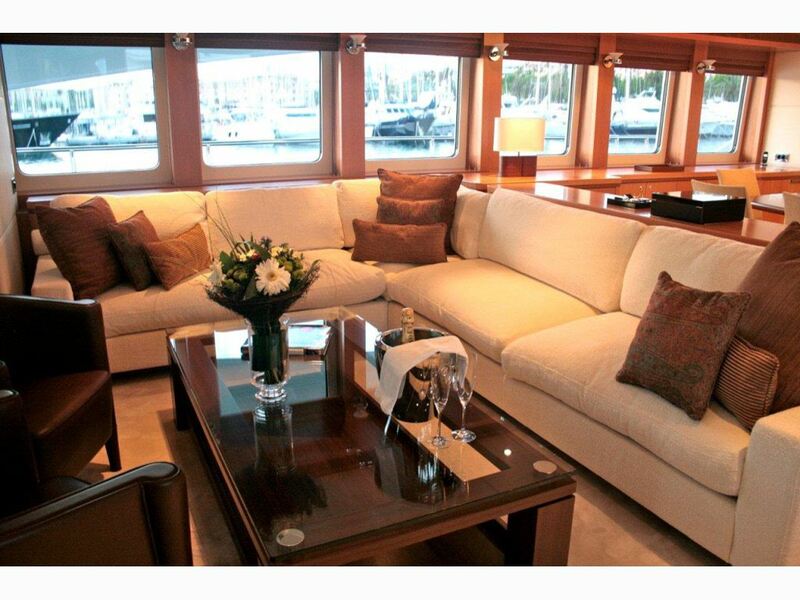 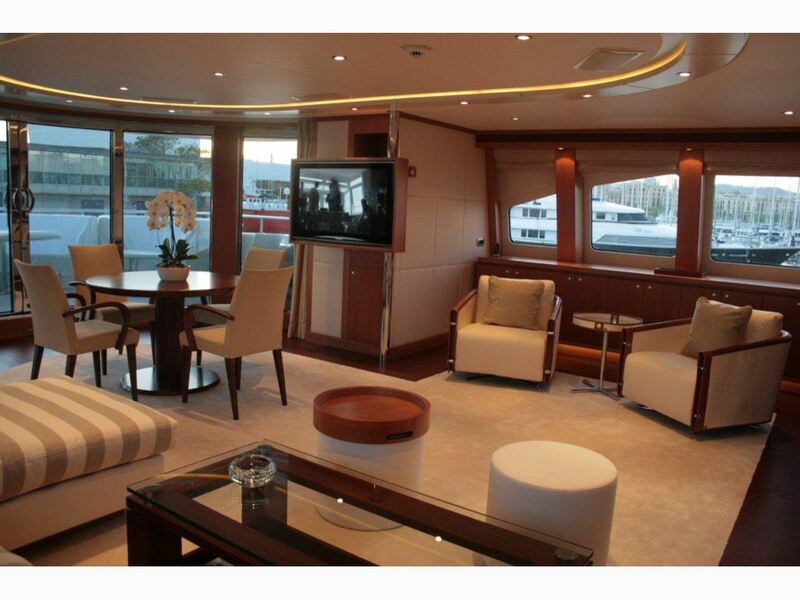 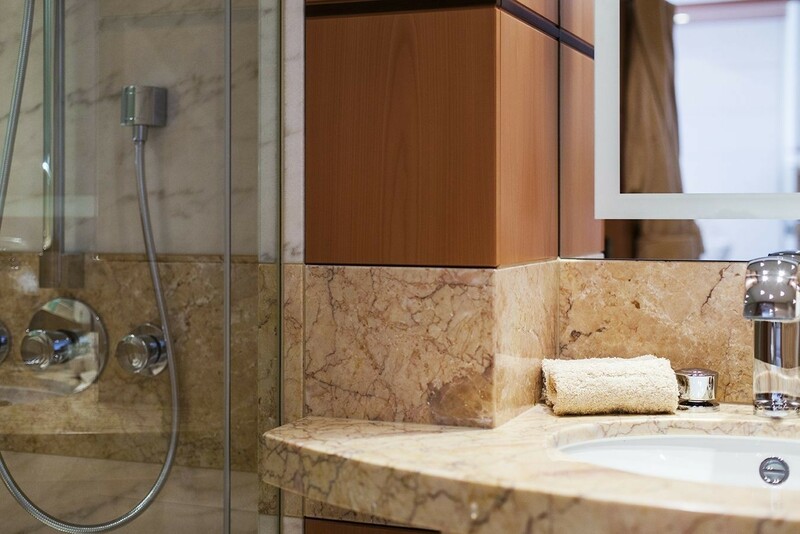 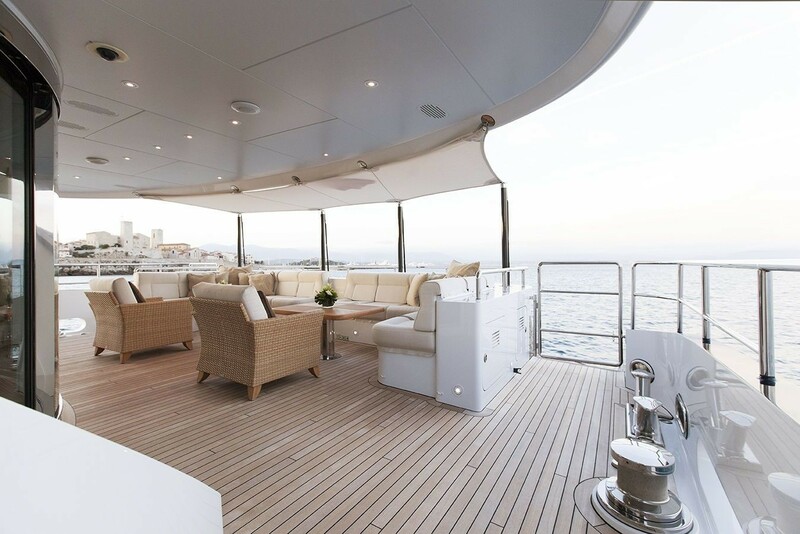 Accordingly, charter guests can socialise in four distinct areas. 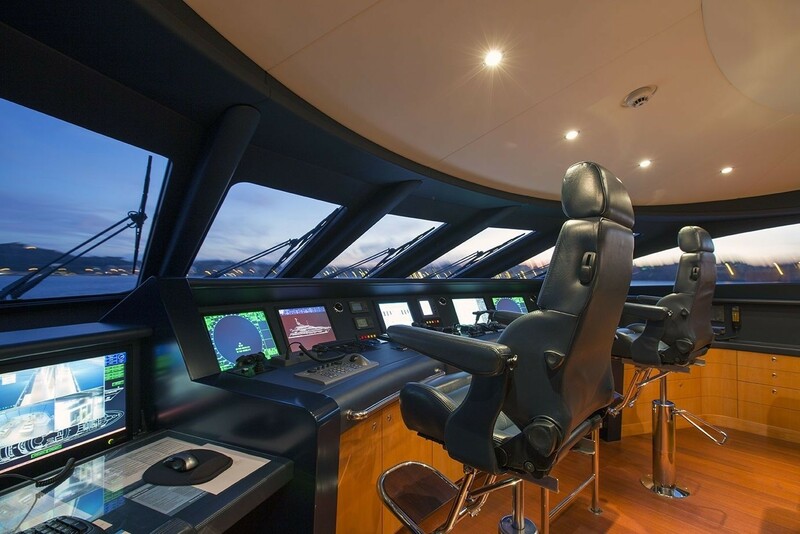 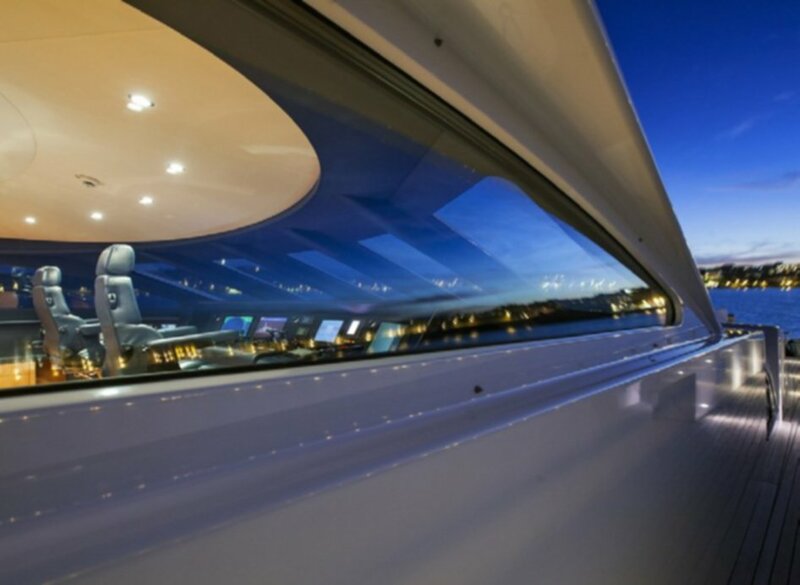 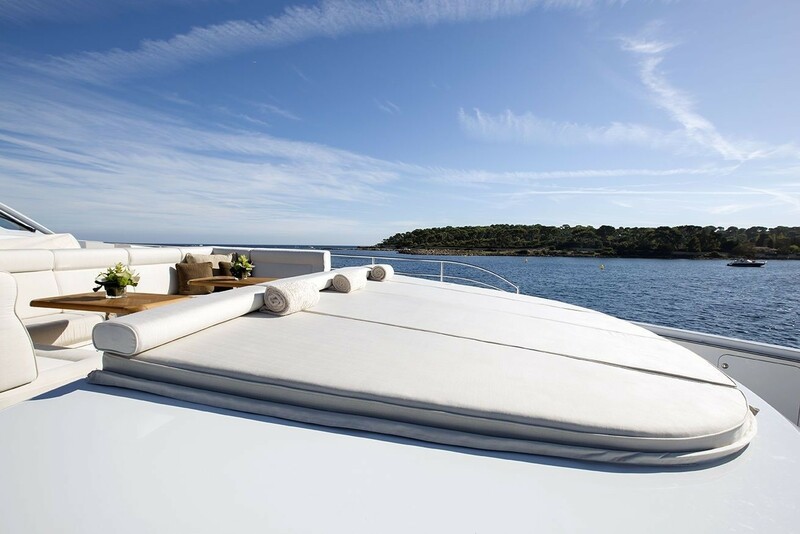 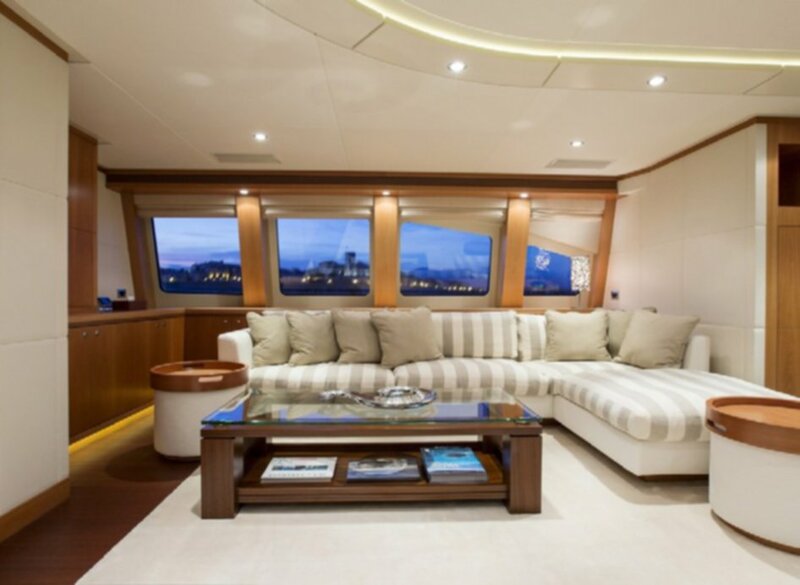 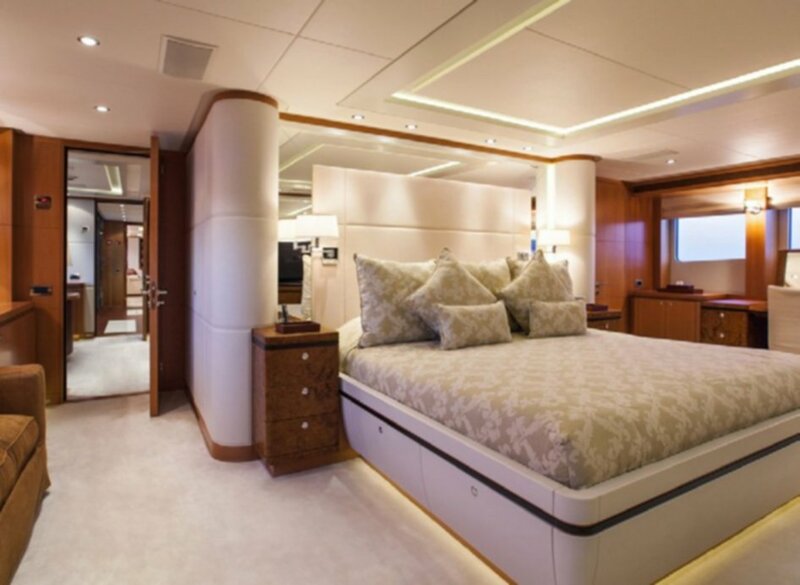 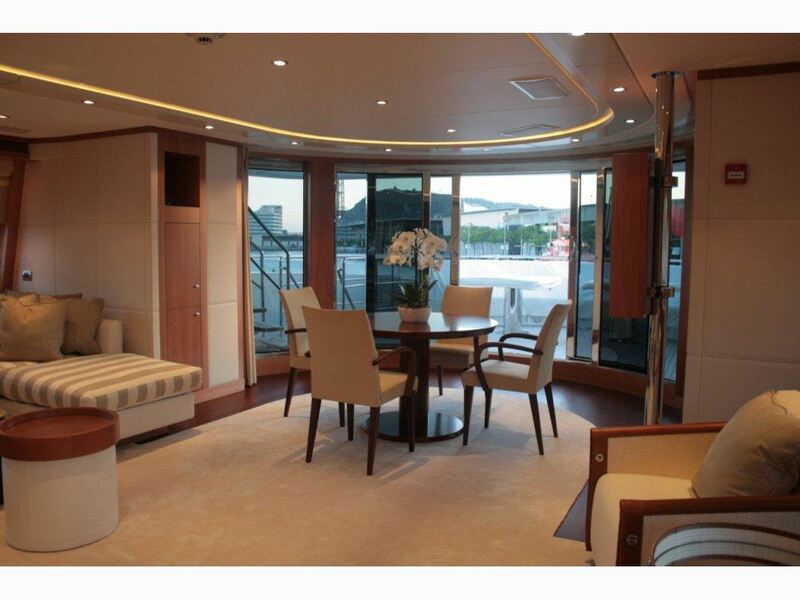 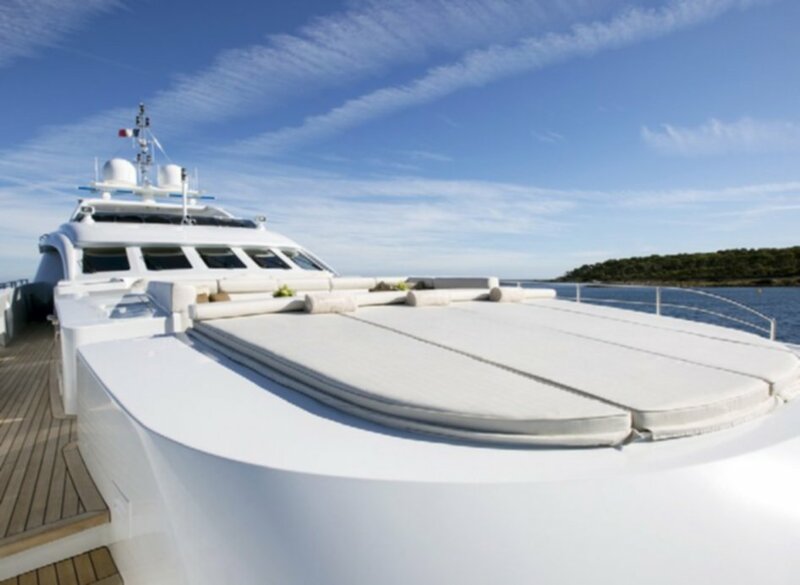 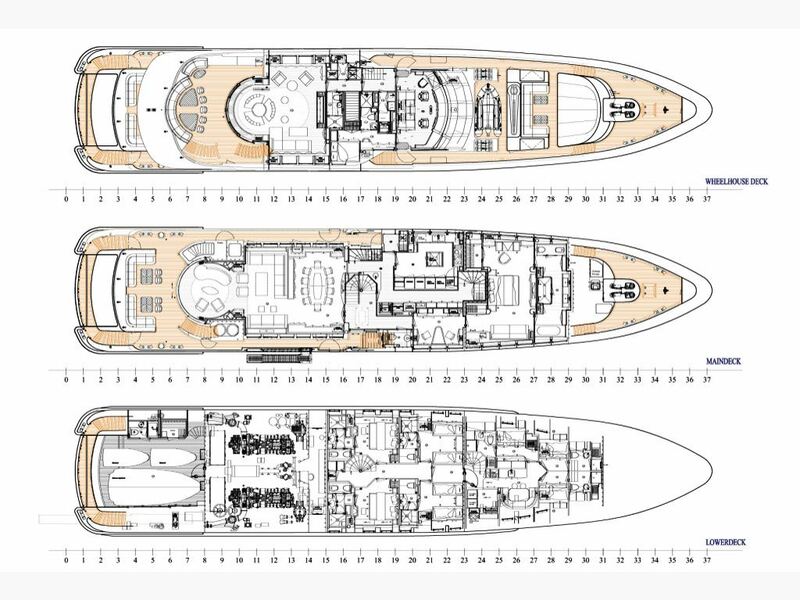 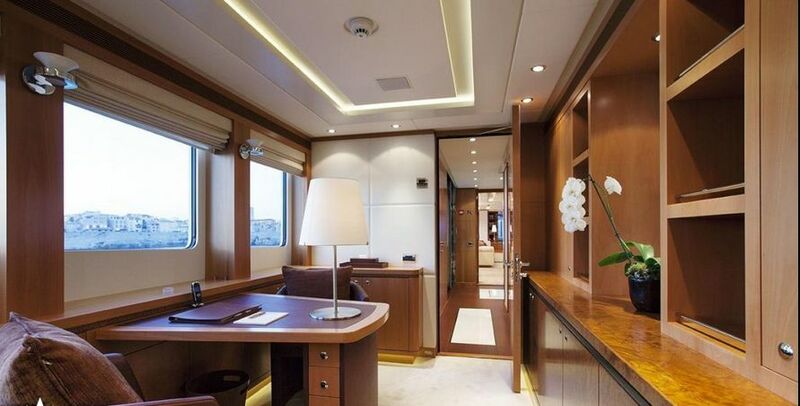 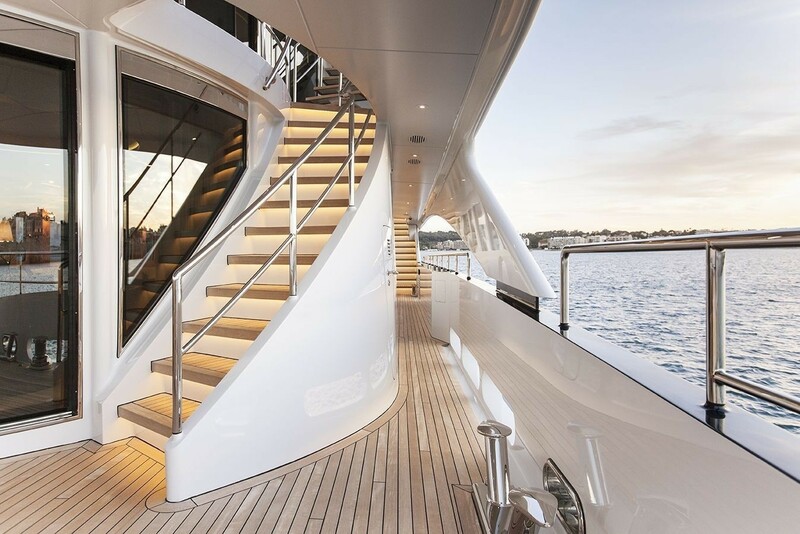 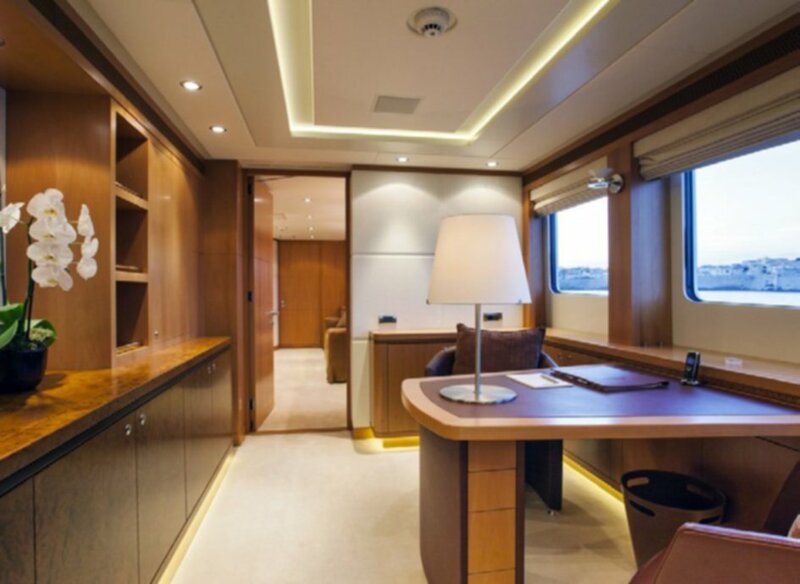 Firstly, the yacht's main deck offers a spacious aft cockpit, and alternatively, there is also the very intimate forward cockpit - ideal for ensuring guest privacy when the yacht is stern docked in the harbour. 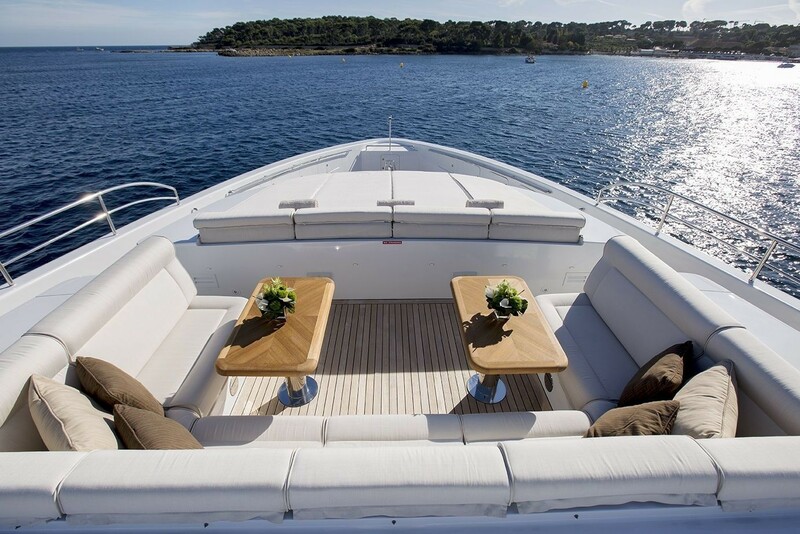 Thirdly, the comfortable aft cockpit on the upper deck adjoins the sky lounge and also aloft there is a very spacious flybridge with a circular spa pool and an alfresco area with a dining table capable of sitting ten charter guests. 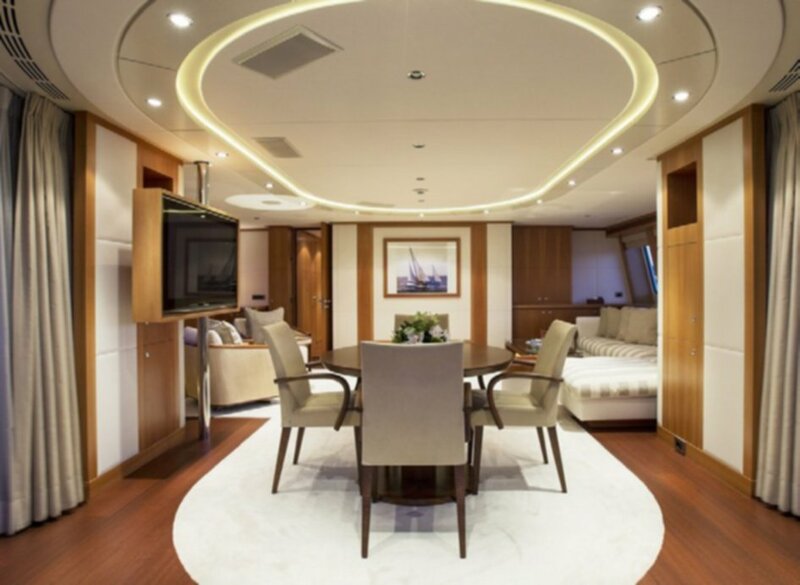 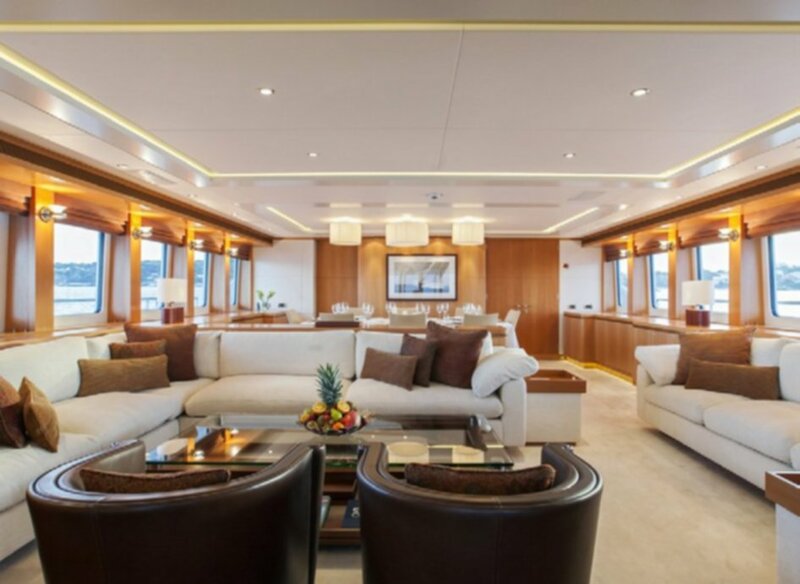 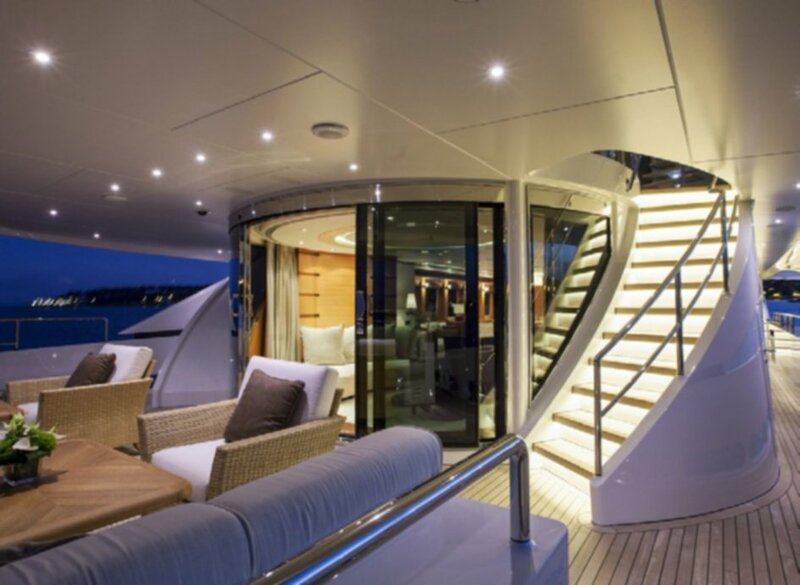 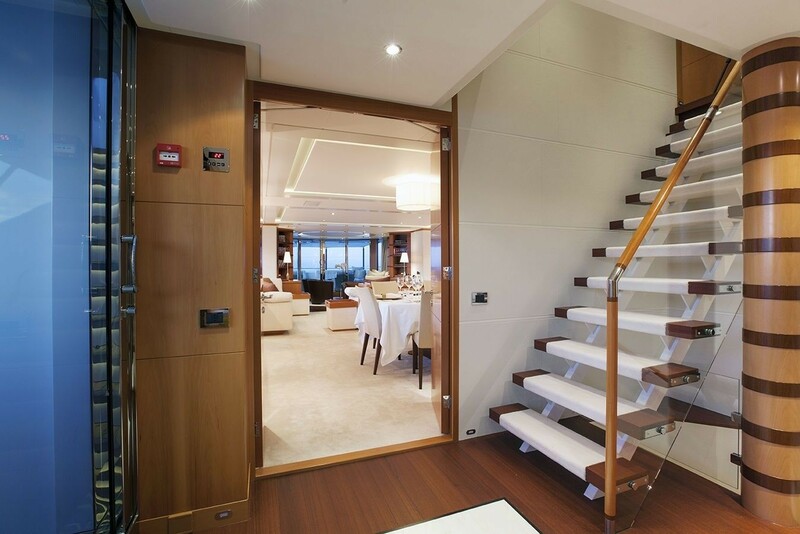 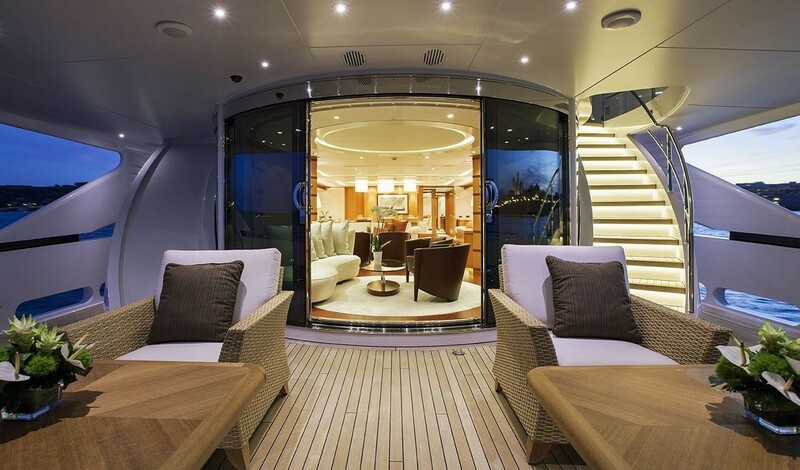 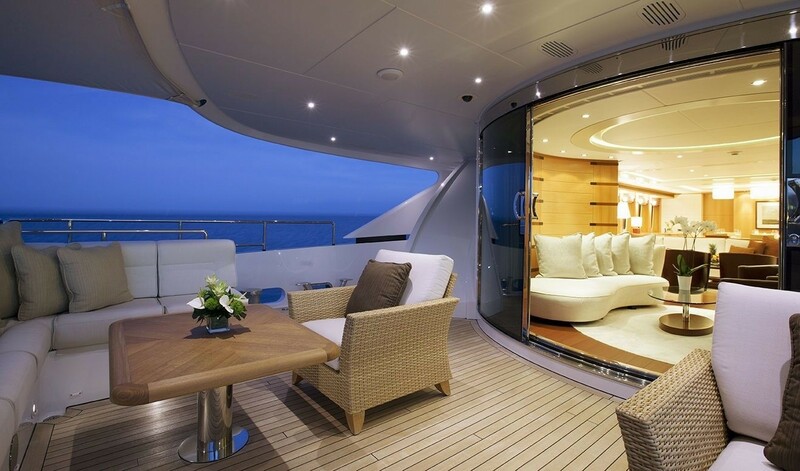 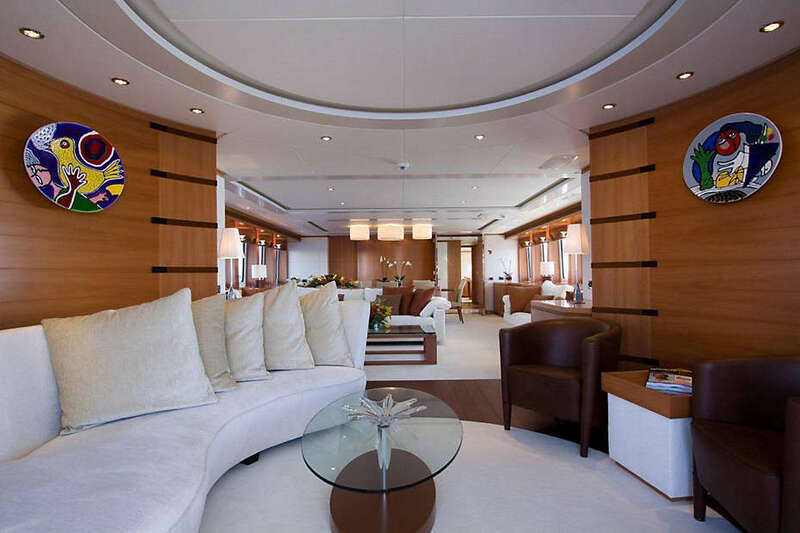 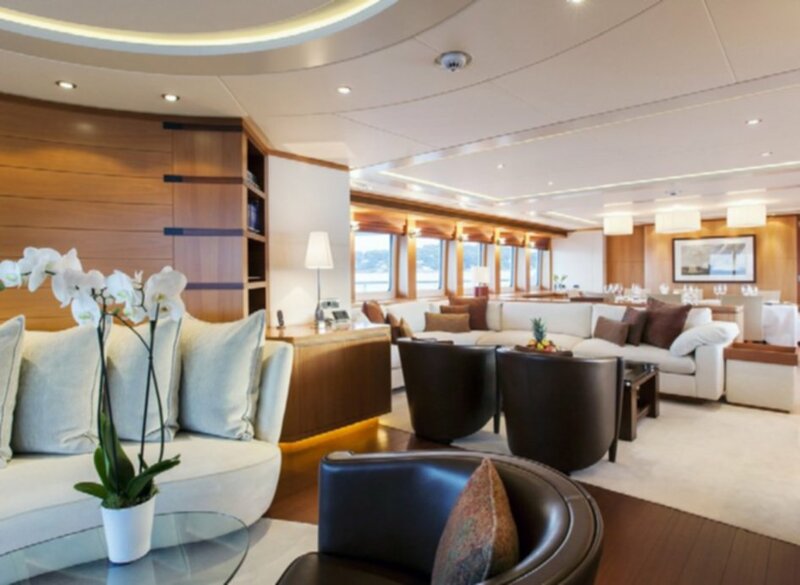 Entering the accommodation from the aft deck, motor yacht SAN BERNARDO's guests are welcomed into a cosy semi-circular conversation area, which leads forward into a more formal saloon. 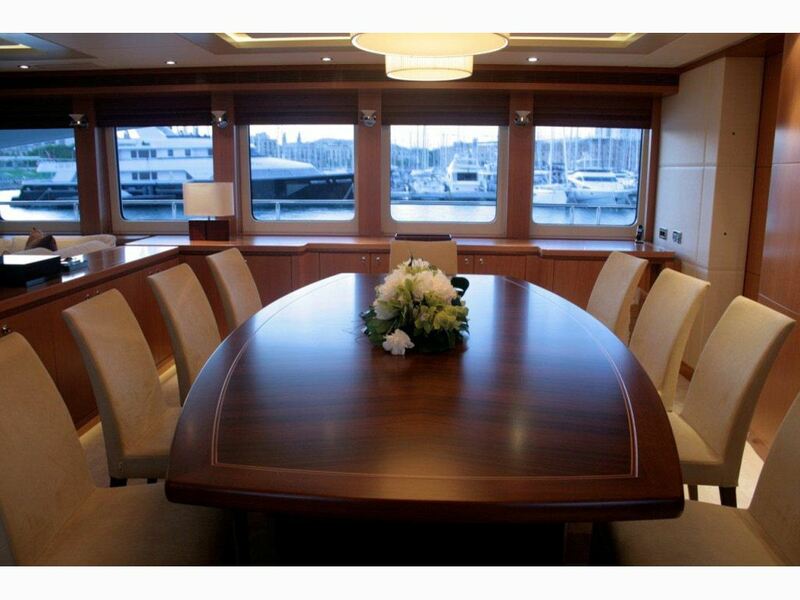 A low cabinet divides the saloon from the dining area, further forward. 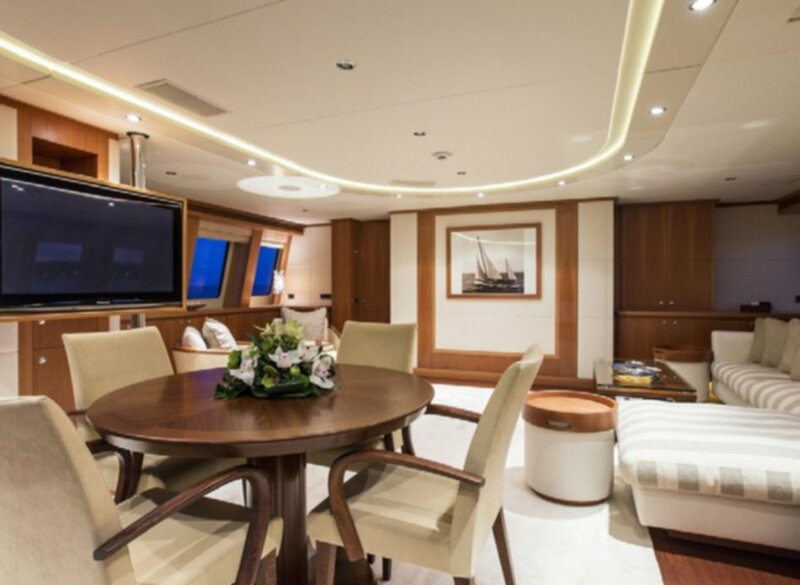 The galley communicates with the dining area through a sliding door. 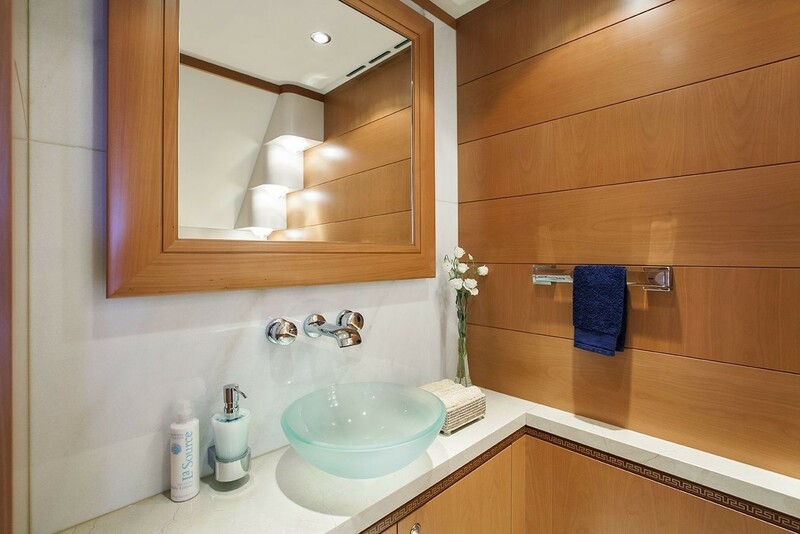 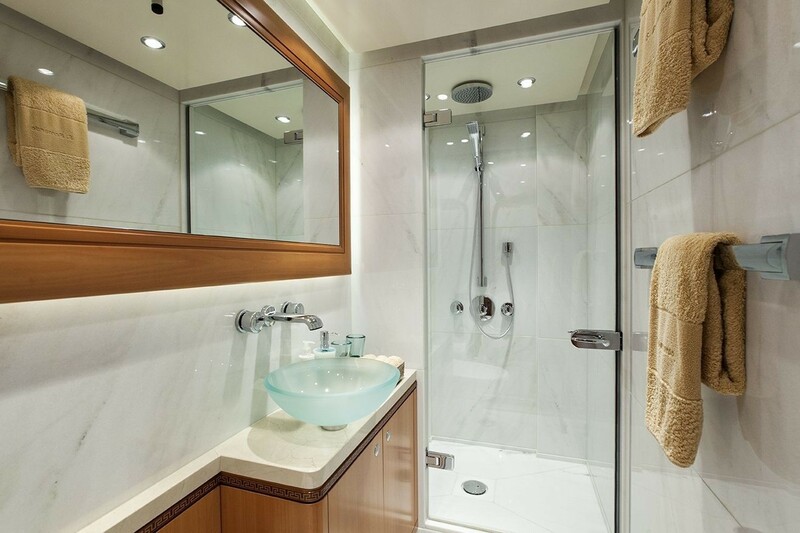 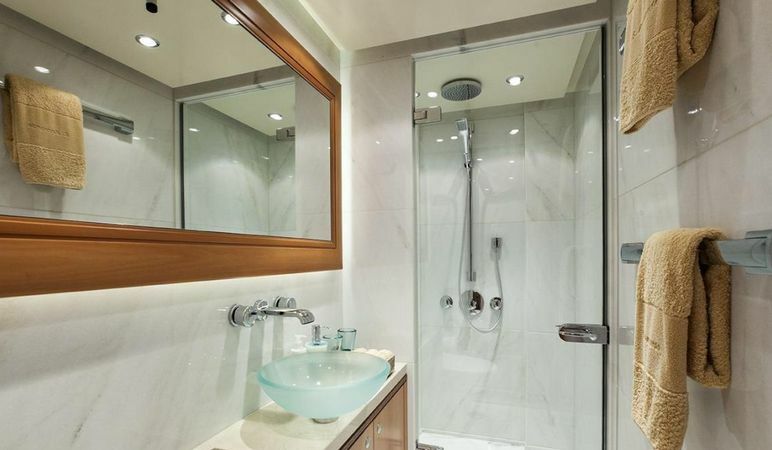 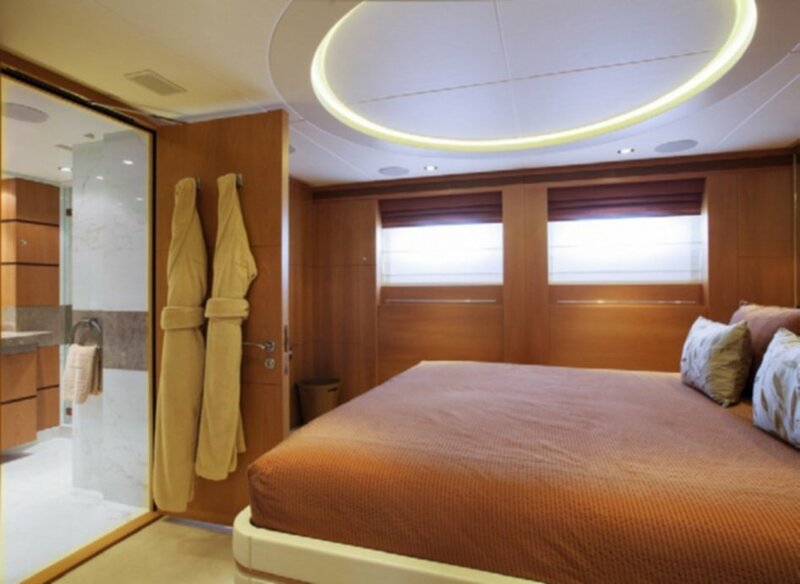 Forward, on the starboard side leads on into the owner's suite, which features a full beam bedroom with an adjoining his and hers bathroom ensuites. 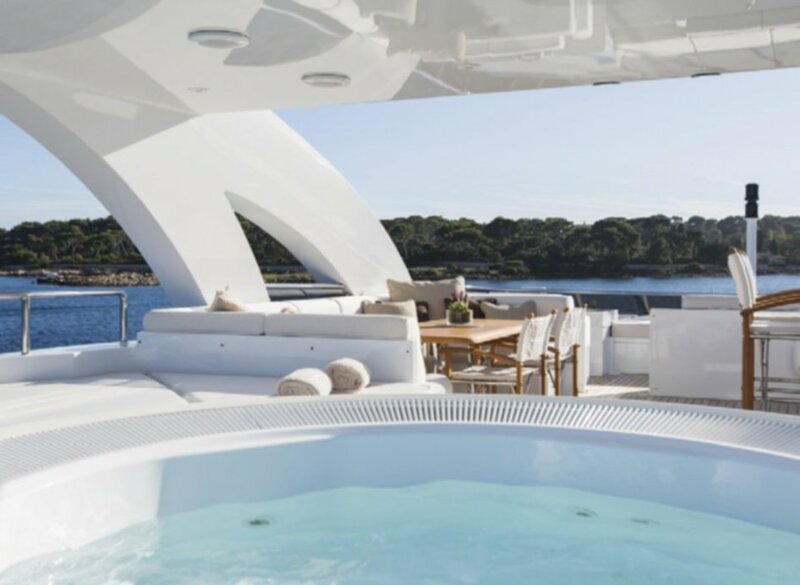 A further eight guests can be accommodated in four cabins positioned on the lower deck, of which two are VIP cabins, and two are twin cabins. 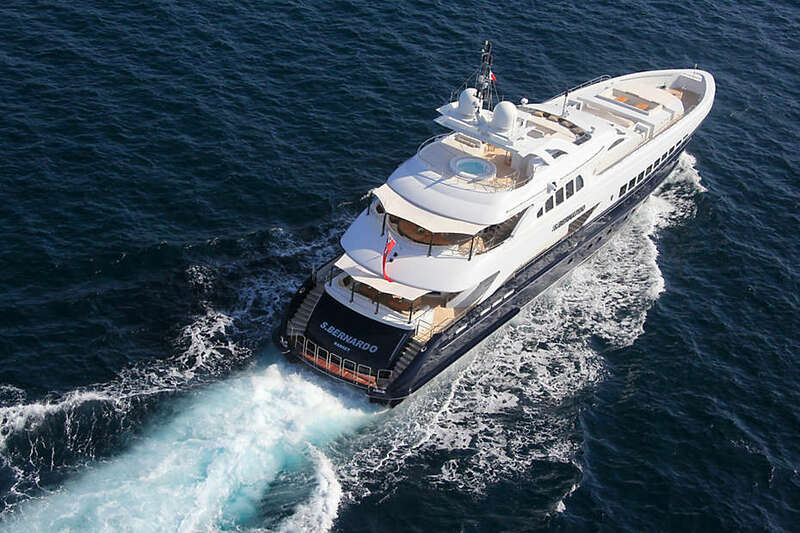 SAN BERNARDO is the seventh yacht launched in the Heesen semi-displacement, all-aluminium, 4400 Class of superyacht. 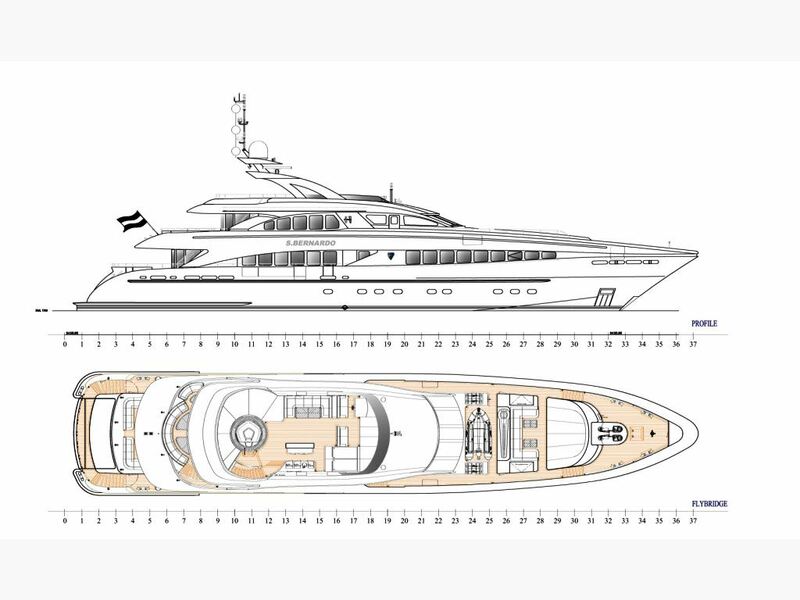 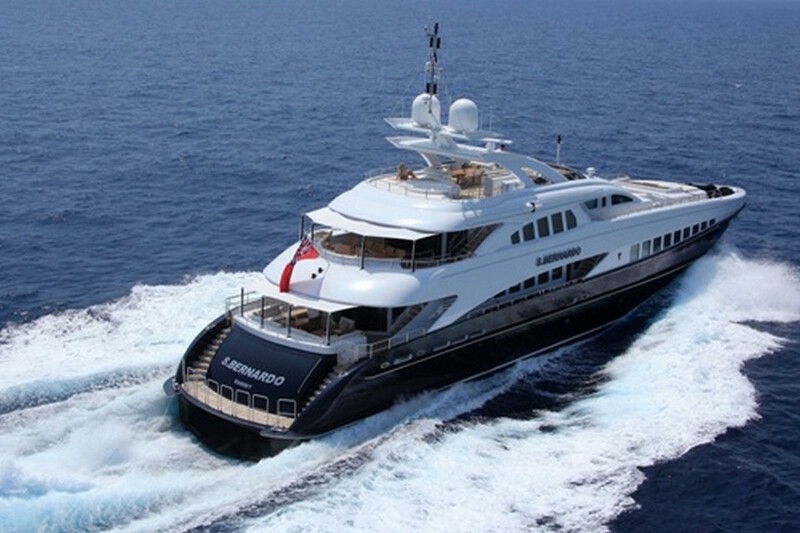 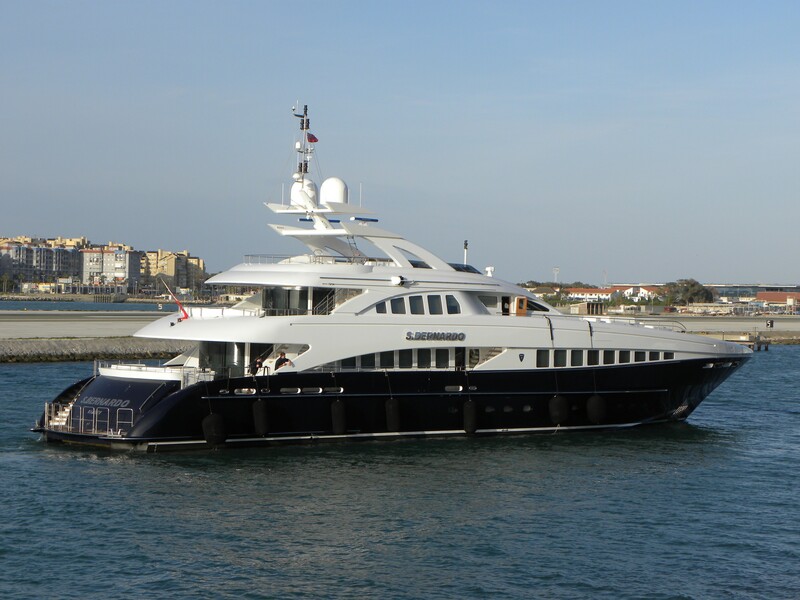 She was created in collaboration with Frank Laupman of Omega Architects who has plenty of experience being active in luxury yacht design for 25 years now. 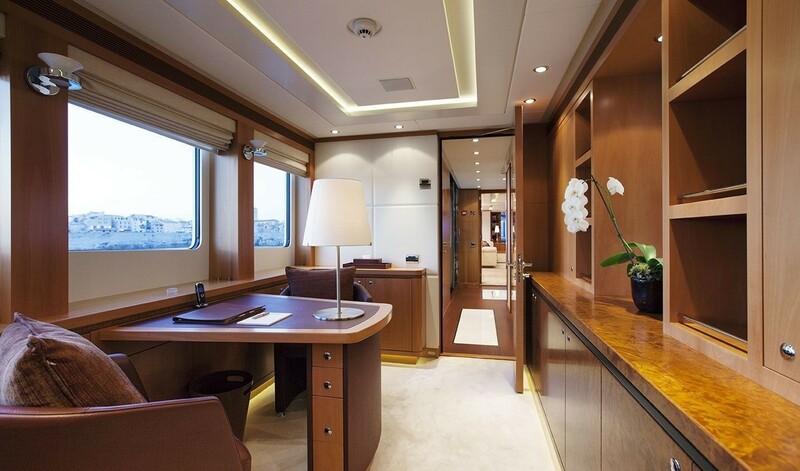 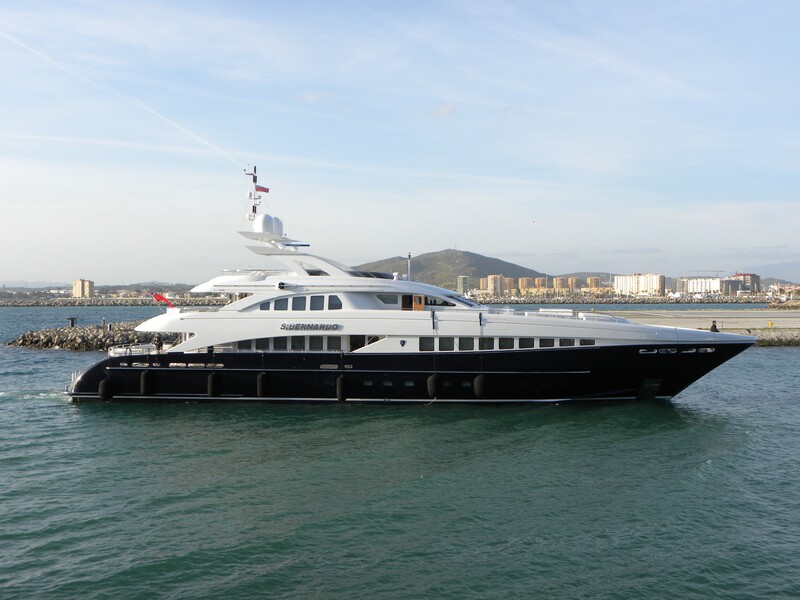 This motor yacht has a potential maximum speed of 25 knots with its twin MTU 16BV 4000 M90 types of diesel, each delivering up to 2,720kW. 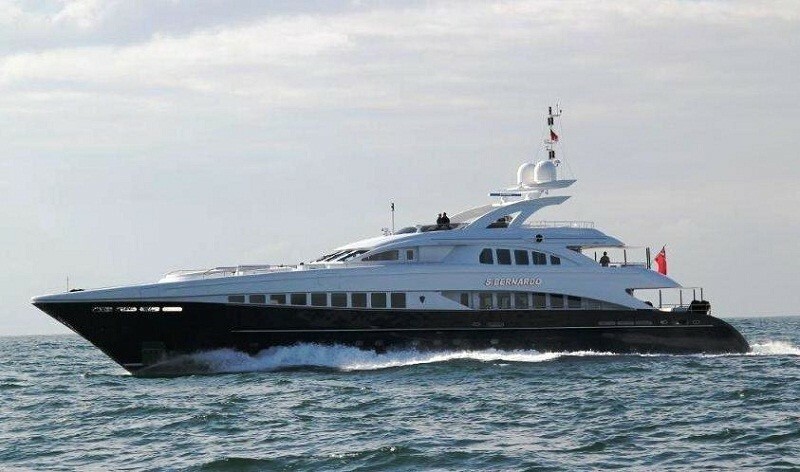 However, her efficient cruise speed is 12 knots. 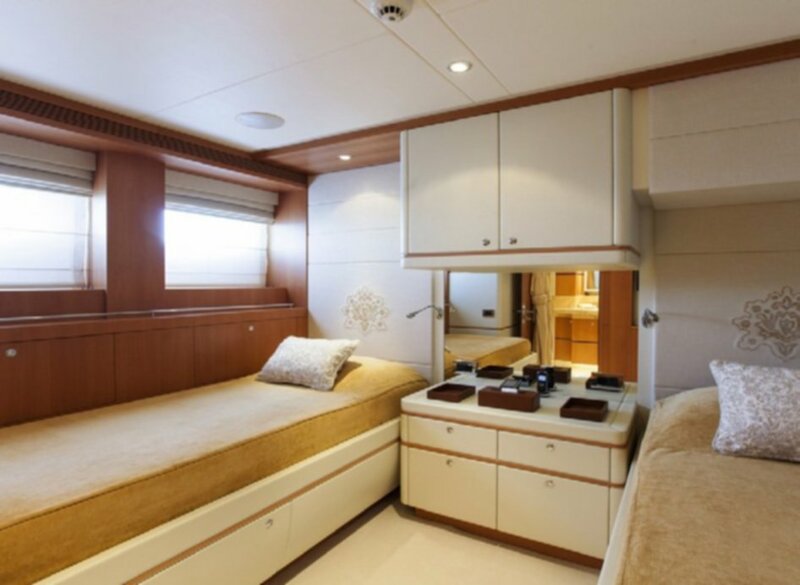 SAN BERNARDO yacht can accommodate a maximum of 10 charter guests, sleeping in five cabins, and 12 guests when day cruising. 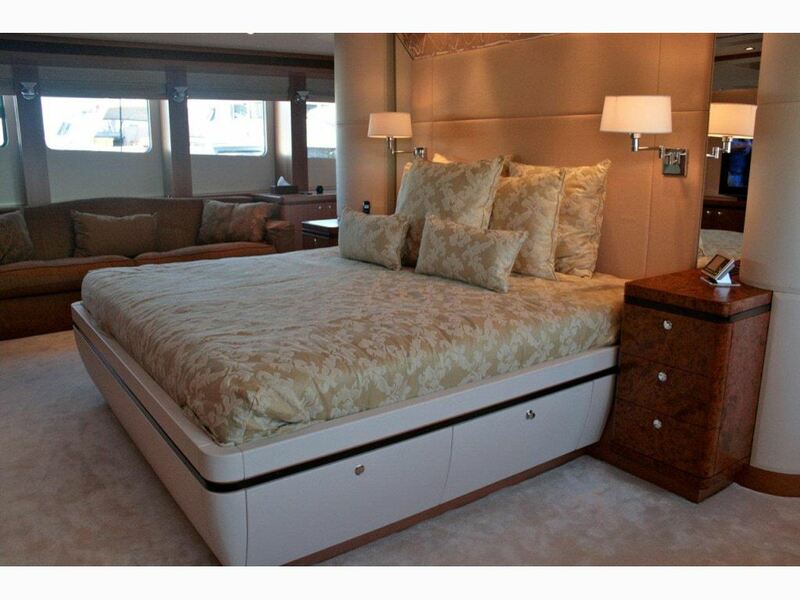 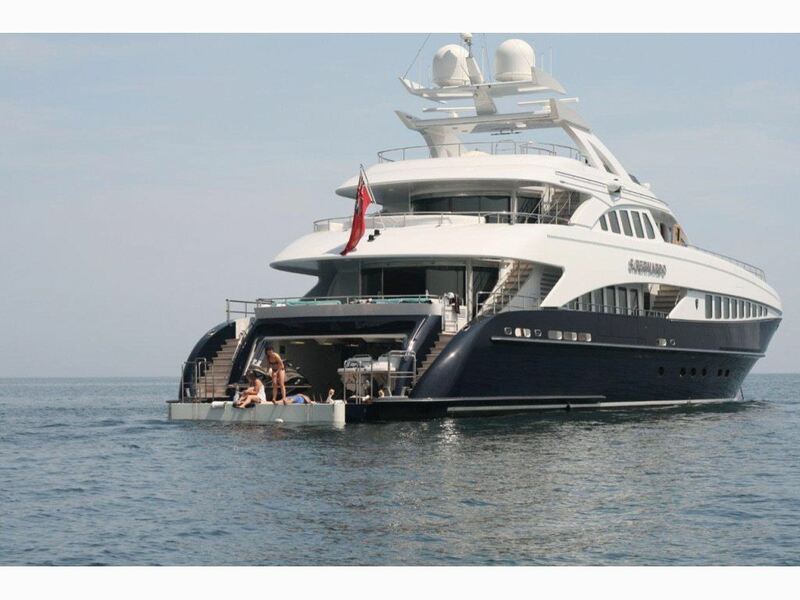 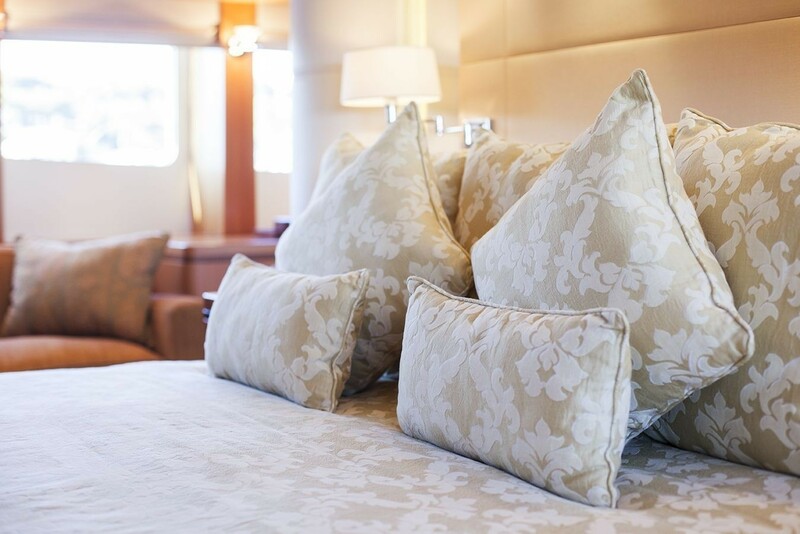 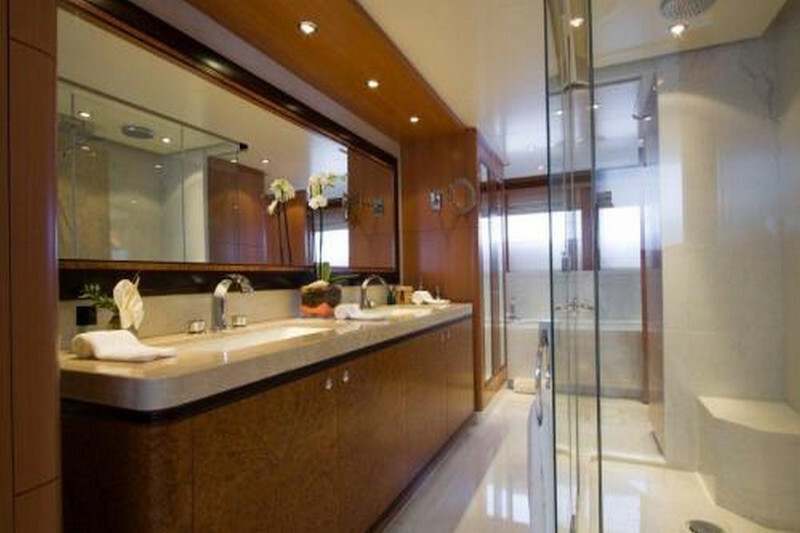 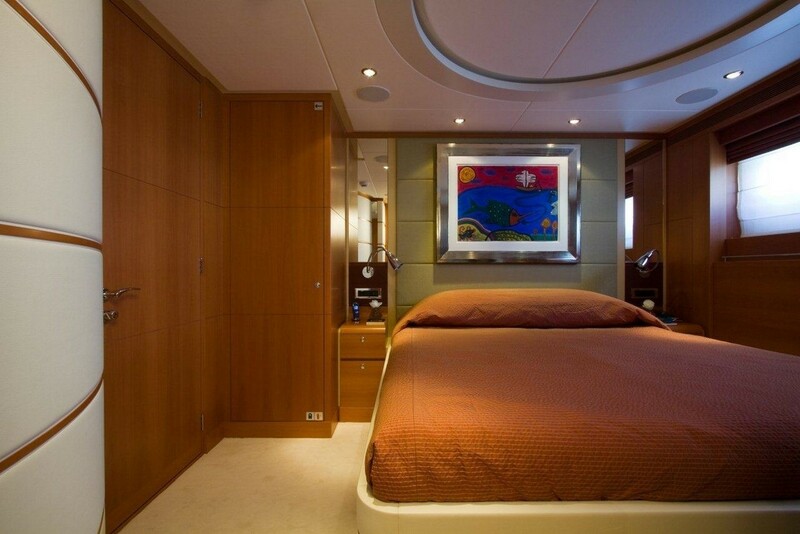 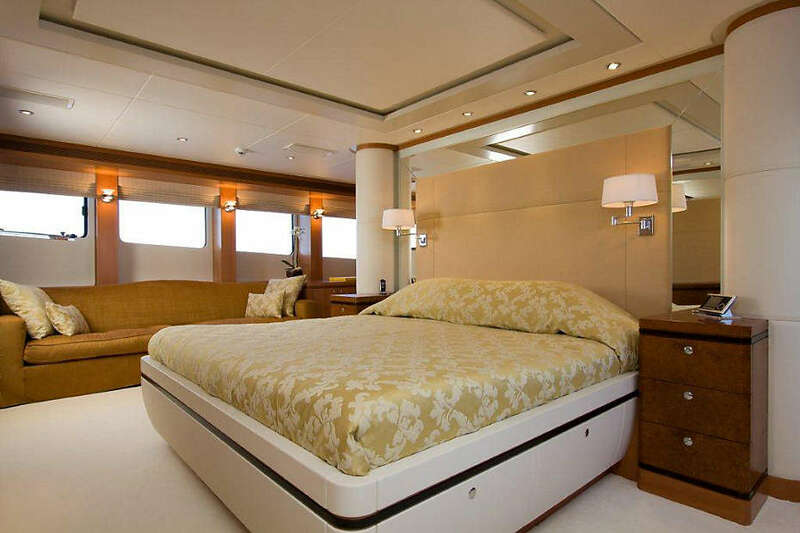 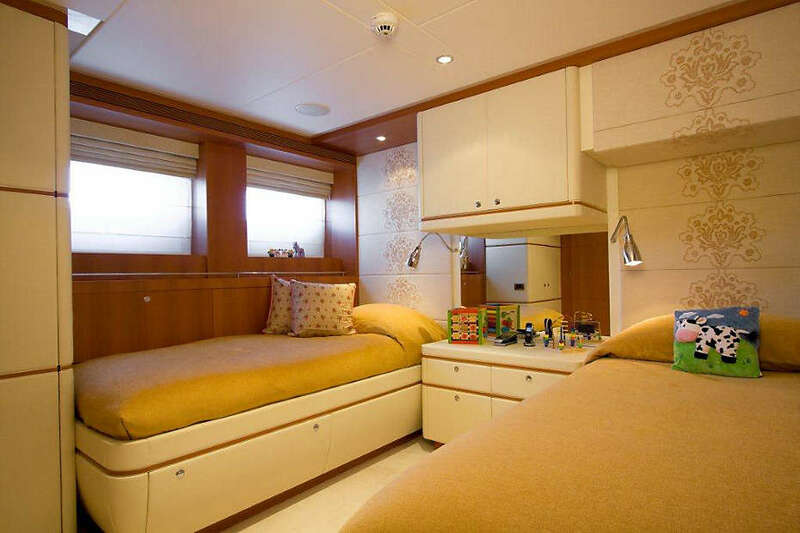 She has three luxurious cabins with double beds and two with twin beds, all of which are fully ensuite.